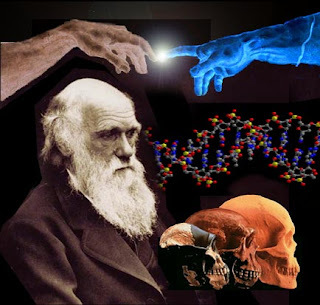 The secular left claims we are evolutionary accidents who managed to crawl out of the slime and by “natural selection” stand erect and over millions of years outsmart our ancestors, the apes. If that is your belief, then you probably think health care should be rationed. Why spend lots of money to improve — or save — the life of someone who evolved from slime and has no special significance other than the “accident” of becoming human? Policies flow from such a philosophy, though the average secularist probably wouldn’t put it in such stark terms. Stark, or not, isn’t this the inevitable progression of seeing humanity as maybe complex, but nothing special? - Cal Thomas, "What Lies Beneath the Health Care Debate"
If there is a line to be drawn between religion and government, you can count on Cal Thomas, believe-you-me-in-residence, to be there providing the crayon. Sometimes he has to reach far distances in order to make the connection, but by diatribe's end he's thumping his chest, feeling mighty satisfied as he puts down the crayon and harumphs his final harumph. For that reason, I usually bypass his 800 words, ubiquitous as they are in every big and little newspaper across our fair land. But last Tuesday I was up in the northernmost north woods of Michigan's Upper Peninsula without a computer or a cell phone signal, and the Great Northern mid-day sun was busy melting everything in sight. In the shaded, slightly-cooler cabin, the Daily Mining Gazette happened to be open to the Op-Ed page, and there he was--that evil, mustachioed grin; that high and mighty forehead; those lidded, serpentine eyes; the buttoned-up collar. He was claiming to know what lies beneath the health care debate. Oh, my God. I couldn't resist. The debate — OK, the shouting match — we are having over “health care reform” is about many things, including cost, who gets help and who does not and who, or what, gets to make that determination. Underlying it all is a larger question: Is human life something special? Is it to be valued more highly than, say, plants and pets? When someone is in a “persistent vegetative state” do we mean to say that person is equal in value to a carrot? Are we now assigning worth to human life, or does it arrive with its own pre-determined value, irrespective of race, class, IQ, or disability? The bottom line is not the bottom line. It is something far more profound. Our decisions regarding who will get help and who won’t are more than about bean-counting bureaucrats deciding if your drugs or operation will cost more than you are contributing to the U.S. Treasury. This connection Cal makes between the belief in so-called "evolutionary accidents" and a total disregard for human life is--can I say?--nutty. Where is the evidence that those who don't believe as Thomas does can't possibly understand that humans are special? Of course we're special. We're so special, in fact, that a whole lot of us lefty heathens work doubly hard to ensure a quality of life for all. A far cry from what Thomas and his kind have been advocating. They're in the business of picking and choosing--who lives and who dies?--and a cynical business it is. They've chosen--proudly chosen--obscene, royal profits over needless suffering of the masses. There is no anger in their hearts for the providers who spend millions of dollars and man-hours trying to figure out ways of maximizing profits at the expense of their clients. Where was Cal Thomas and his bunch when the Bushies were giving health care providers free reign to charge whatever they wanted and to consistently deny humane aid to their paying, special, human customers? Where is Thomas, even now, when millions of those special humans are jobless and homeless and without health care or even decent meals for themselves and their families? Have you heard any shouting from Cal Thomas now that the U.S. Chamber of Commerce is waging an all-out battle against the government (that's us) to maintain their rapacious strongholds? Those same destructive strongholds that have brought us to our very knees? Much to ponder in his ponderous piece, what with references to people evolving from slime, and 100-year-olds with inoperable brain tumors, and "Bruce Almighty", but can you scratch your head and laugh out loud at the same time? Okay. How about this? We are now witnessing some of the consequences of attempting to ban people with a God perspective from the public square. If there are no rules and no one to whom one might appeal when those rules are violated, we are on our own to set whatever rules we wish and to change them in a moment in response to opinion polls. Any appeals to a higher authority stop at the Supreme Court. The GOD PERSPECTIVE?? The public square? And this has WHAT to do with What Lies Beneath the Health Care debate?? So, I know I'm dense when it comes to Cal and his super-Califragilisms, but is he saying we have no business fighting health care Big Business because we're not religious enough? And is he saying that if we were religious enough, we would STOP fighting them? I don't know. I'm so confused. But it seems to me if you were Cal Thomas and you saw humanity as something special, brought to you by the God of your choice, you would be working overtime to keep them well and away from the clutches of the so-called health care providers who have proven to be anything but special. And you might even want to cut yourself off, mid-harumph, to put that word "slime" in its proper place. I hadn't known Cal Thomas before today. and I don't want to know him. I was just getting ready to go get supper-- but I've lost my appetite. Uh, oh, TC, don't want to spoil your dinner. Sorry about that! Count your blessings that you've never run into Cal Thomas before. He's a slug and always has been. I thought he had retired, but NOOOO. . .there he was. Couldn't even get away from him in the north woods. I've reopened Scattershot Thoughts -- an old blog. After closing PP&D because I was burned out on political stuff, 5 or the first 6 posts on ST have been political. I guess I can't get off that easily after all. Still, at least I don't feel obligated to post all politics all the time. Please drop by-- I miss you.